Since I had a skein of sock yarn already in cake form sitting in the knitting bag next to the couch, and, it is summer, (as I have been reminded) I decided to knit socks. I do not remember what the previous plan for this yarn had been, but now they are Circle Socks. I think I got the pattern idea from Squish adding it to her queue. I made a few changes--knit them toe-up, fewer total stitches, Sweet Tomato Heel (youtube link), fewer pattern repeats, and added a little bit of ribbing at the top. I really like them, though I cannot get a good photo that shows the colors right to save my life. The pattern is easy, and the texture is nifty. I like the Sweet Tomato Heel, and it was good to learn something new. I also learned that I should not work it over 2/3 the stitches if I am making socks for Bruce. These are his socks, but my nephew has already tried to steal them. Maybe I will knit a pair for him next. Then again, his dog loves to eat socks, so maybe not. Besides, I just checked the calendar, and it is Tour de Fleece time. Yikes! Just popping back in because I have a photo, or something. Yeah, two more sets of sixteen POP! Blanket squares. These are the third and fourth sets, if you're keeping count. Actually, that remains true even if no one is counting, but that is a different topic. As far as knitting goes, that is pretty much it. Life goes on as it does, the seasons change, and the fact that I have not blogged each bit of it is something for us to all put in our gratitude jars. Anyway, there have been some really nifty and exciting things happening. For example, my nephew, Harrison, had his first birthday in April. A month from now, it will be time to celebrate the first birthday of my niece, Madeline. And before the year is up, Harrison will have a new little brother or sister. The due date is 11-12-13, and the appointment to discover the branding of new baby is sometime the first week of July. I have been thinking about the next knit, and I am just not sure. 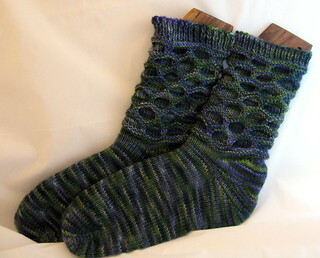 It has been quite some time since I have had lace on the needles, and socks seem like I good idea, too. 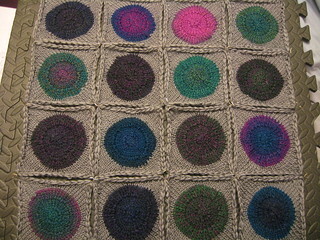 Then there is the 2013 Entrelac thing. No, I won't be combining it with either Forest Path Stole or Entrelac Socks, but what I will do next remains to be seen. 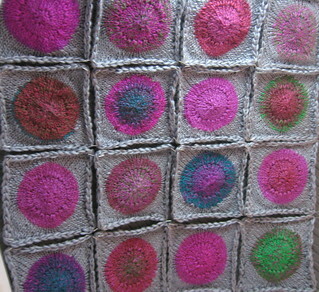 In the meantime, I will keep knitting the blanket squares. It feels like quite the accomplishment that I have kept up with the end-weaving part of the project. I was trying to recall just how many squares I planned for this blanket. I think I might have decided on 100, so that means I am over halfway there, but still have plenty more to go.